This recipe is mighty tasty. The picture doesn't do justice to the uniquely vibrant flavours... sweet, tangy, spicy, musky... I can't quite put my finger on what exactly makes it so darn delicious, but trust me, it is! In a small sauce pan, heat the vinegar, sugar & salt until just dissolved. Then turn off heat. Add in garlic, lime zest & juice, chile and sesame oil. Set aside. Heat up the sunflower oil in a large pan or wok, and fry the eggplant until golden brown. Place in a colander, sprinkle liberally with salt, and set aside to drain off excess oil. Cook the noodles in boiling water until al dente. Drain, and rinse with cold water. 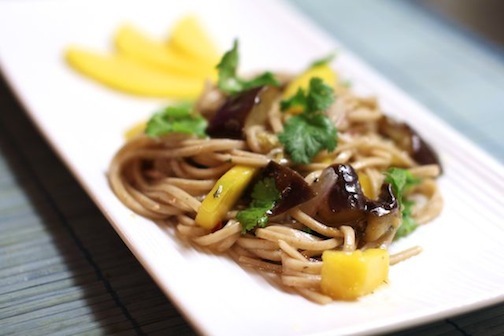 In a mixing bowl, toss together the noodles, dressing, eggplant., mango, herbs and red onion. Serve right away, or set aside for a few hours to allow the flavours to blend. Oh, I love udon noodles! There's something so hearty and satisfying about them. Yum Yum Yum. I am such a huge fan of Udon noodles! I'm definitely going to try this. The mister and I both love udon noodles, so I'll take any excuse to cook some up. Thanks! i love udon and your recipe is fantastic! 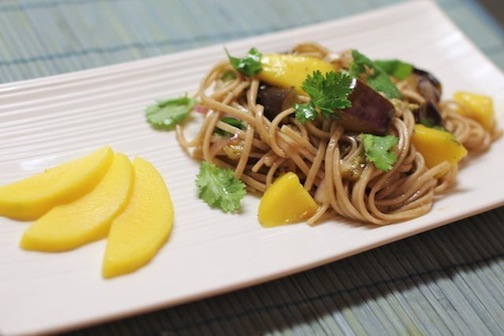 the unique combination of eggplant with the sweet mango sounds delicious. keeping this on hand for the next noodle night. Did I miss something? I don't see any mango in the list of ingredients. I assume it is just one mango that's needed, right? Sounds delicious.